The Elis dining chair is a modern style chair that will suit an array of interior spaces. Can.. 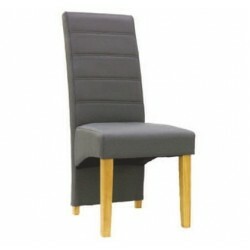 Chair - Solid hardwood with black faux leather seat pads DIMENSIONS H94cm.. The Roscrea collection is manufactured from acacia wood, an Indonesian solid wood that is of superio.. Stylish chair that is a bit different than its contemporaries. With a solid oak leg, it has Leath-Ai.. Finish: Grey, Cream, Natural, Black & Green (All distressed) DIMENSIONS 500(w) 5..